When learning proper ergonomics in the office, chair posture is really key to avoiding unnecessary pain. I want to teach you how to set up your chair to have the ideal support while working at a desk or computer. Can't change your chair? I can show you ways to work around a "less than ideal" chair as well. Before I give you specifics on how to set up the chair, I want to point out that sitting static in a chair for long periods of time is not ideal for your health and in particular for your muscles. I would encourage you to get up frequently, at least once per hour to move and stretch. I would also encourage you to switch up your sitting posture periodically. The proper sitting posture page has a more complete discussion. Let's start with the chair. Your seat height should be set so that your feet rest flat on the floor with your knees at a 90 degree angle or more. The backs of your thighs should not be compressed by the edge of the chair, which happens when the chair is too high. The seat should not be so deep that the backs of your knees are compressed. The seat should not be too low, so that your knees are higher than your hips. Too high: Get a stool or telephone books to support your feet on. Too low: Sit on a cushion. Too deep: Put a cushion or lumbar support behind you to push your body out from the back of the sea. For proper office chair posture, there should be back support at the level of your belly button, allowing you to push your bottom all the way to the back of the seat while feeling support in your low back. Ideally, there should be a back to the chair that comes up to the bottoms of your shoulder blades and helps to support your arms. It should recline about 15 degrees, allowing your hips to be a little more open, and support you in leaning back. Use a lumbar support cushion. You can try rolling up a bath towel folded in half - it should end up about 3-4 inches in diameter. Suspend this from the top of the chair to waist height. Use a rubber band at each end to keep it rolled. 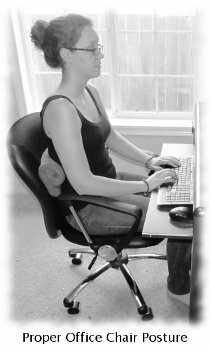 With office chair posture for computer work, it is best to have arm rests that allow you to sit in the ideal posture with your back supported and your shoulders down, that support your elbows so they don't have to hang down while you type. If they are too high, they make you shrug your shoulders to use them, stressing the upper trapezius muscle and the levator scapulae (eventually causing headaches and neck pain). The same muscles are stressed when you try to work without arm rests. If they are too low, you slouch to get your arms on them. If the chair is too wide, you can't reach them to use them. If they are too high, put cushion in your chair to raise your body up. If they are too low, tie a towel or cushion on them. If they are too far away, strap a padded board or cushion to them that angles in toward your body. If you don't have arm rests, make sure that you can rest your wrists on the surface in front of the keyboard. A gel pad is great for this. 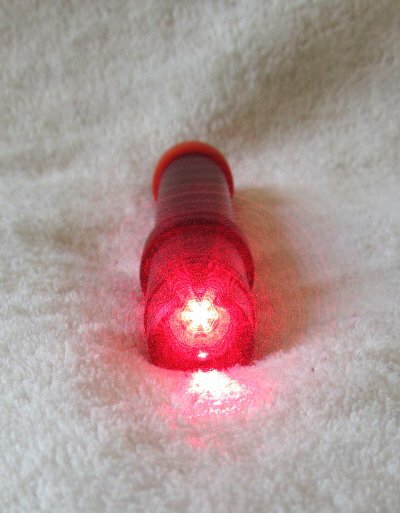 You can also try a soft rolled up towel or baby blanket. Buying a New Office Chair for your Posture? Does the seat adjust so your feet rest flat on the ground, with your knees at 90 degrees? Push yourself to back of the chair. Are your knees clear of the edge of the seat? Is there lumbar support keeping you from slouching? Does the back of the chair come up past the bottom of your shoulder blades? Does the chair recline slightly, and support you when you lean back? 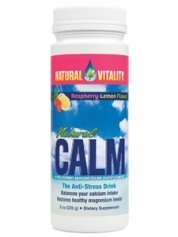 Are there arm rests that will support your elbows when you are sitting back in a neutral position? Do the arm rest adjust so you aren't slouching or hiking your shoulders put your elbows on them? Are the arm rests in a position where they will allow you to pull forward to your desk to type? If other people will be using it, can it easily adjust to support their structures? Now that you know how to set up your chair, go learn how to sit properly! 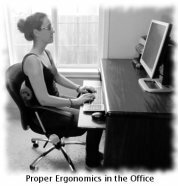 The rest of the ergonomics in your office are also important. You should have your keyboard and mouse an monitor in the right place, and avoid hurting yourself with the phone. 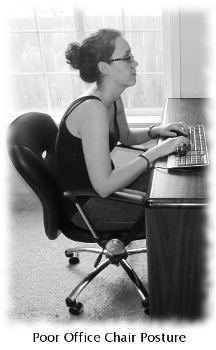 Return from Office Chair Posture to Ergonomics in the Office. Return from Office Chair Posture to Muscle Pain Solutions Home.